Here at Sew What?, our focus is on the manufacturing of custom stage drapes and other soft goods. Along the way, we love to educate our blog readers about stage drapery – from the different material options to fullness to finishes. While Dutch Label Shop is focused on sewing apparel (they sell custom clothing labels), this post applies to fabric used in a variety of applications – including stage drapery and soft goods. For example, for digitally printed backdrops, we have both knit (such as Heavy Knit) and woven (such as Cotton Canvas) fabrics available. We utilize many fabrics, both knit and woven, when making custom stage drapes, mixed media backdrops, LED Stardrops, and other stage soft goods. Of course, different fabrics work better for different needs, so we always offer the most appropriate fabric for the project – whether that be a knit fabric or a woven fabric. As nice as it is to be thankful all year round for everything wonderful we have going on in our lives, it’s always especially good to have a “gentle reminder” from a federal holiday to remind us to stop, take a moment, and truly appreciate everything that we have, and are able to accomplish, on a daily basis here at Sew What?/Rent What? Inc. We are so very grateful for many things indeed, as it has been a tremendously exciting year here for the entire company. We have been able to finish the streamlining and revamping of our website to now be compatible with all things electronic, which helps make it a lot easier to navigate and access all of the really cool information available. Internally, we’ve had several positions be modified to better utilize some of our employees’ best skill sets and talents, which we are delighted to say has turned out to be quite successful. We’re also very proud to have been able to steadily increase our Specialty Rental Drapery Collections to include some new beautiful, one-of-a-kind drapery elements we can now offer our amazing and creative customers. Also, we are beyond thankful when our clients share photos and videos from their special events and tours, and we get to see—and then get to share with ALL of our clients—some of our beautiful custom-built and specialty rental draperies and soft goods “in action” with all of the imaginative and spectacular ways that our clients decide to design them with. And as for the staff themselves, we’ve had some fantastically fun events and occasions here as well, which is always a special treat for everyone and a great way to really connect with one another on a more personal level. Coming up soon is our VERY popular Thanksgiving Potluck Celebration, which we look forward to all year long. And soon after that is our Christmas get-together, which is always a festive way to get all of the hard-working “Whatters” in our offices and warehouse in the holiday spirit. Being sincerely thankful on a regular basis has been proven to be very good for your overall health, as well as your heart, mind, and soul– and luckily for us we have a LOT to be thankful for around here! 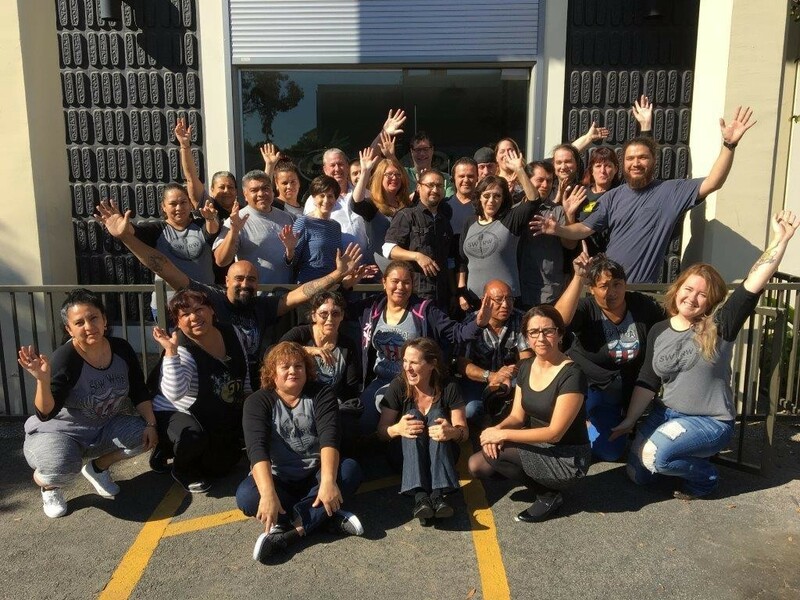 But most of all, we are thankful for our incredible customers—some whom we have been working with for a decade or longer, and some that we’ve started new relationships with just this past year. We look forward to what the new year will bring us, and hope that you and yours have a delightful holiday season, followed by a successful and joyous year to come! Sew What? 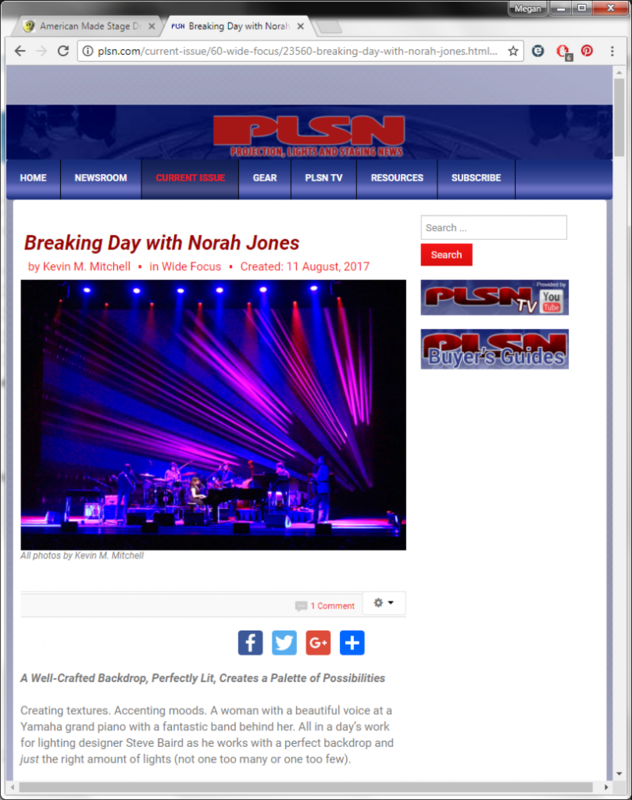 Inc backdrop for artist Norah Jones featured in Pro Lights and Staging News. 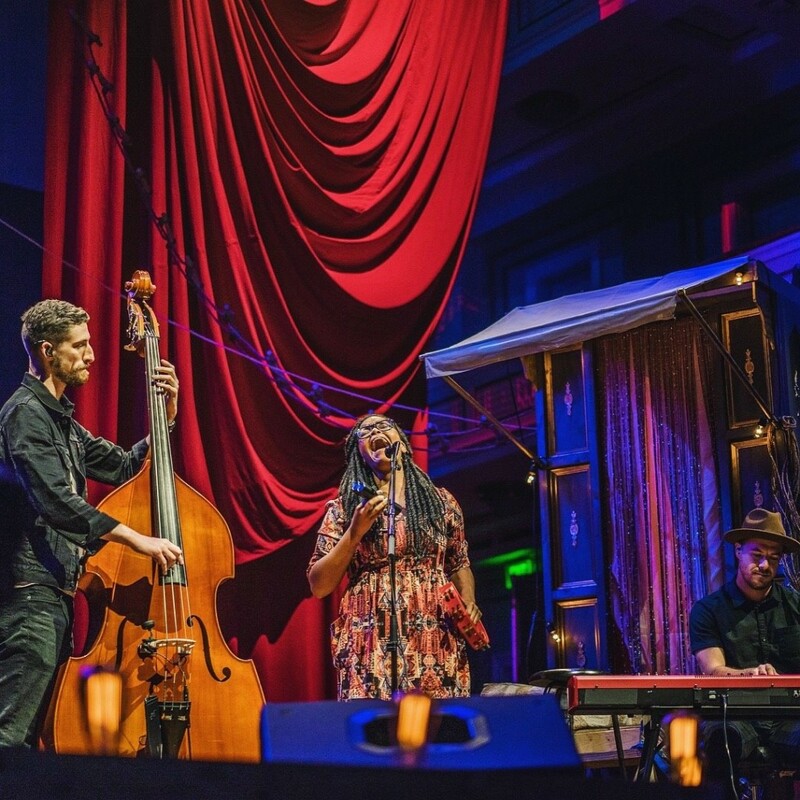 We are excited to announce that the mixed media backdrop which we recently crafted for artist Norah Jones 2017 Day Breaks Tour was featured in Pro Lights and Staging News. 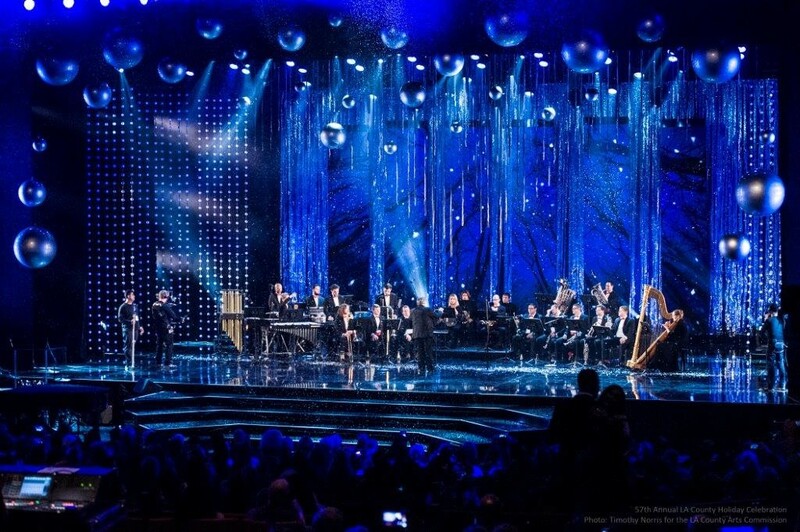 In this article by Kevin M Mitchell, Lighting Designer Steve Baird is interviewed and, along with lots of wonderful images, he discusses and explains the various lighting conditions that are used with the backdrop and how they are achieved with specific lighting and projection equipment. Please take a moment to support this publication and stop on by the link below to read the article in full. Do you have a softgoods or backdrop need for an upcoming tour? Visit our Portfolios and you’ll find we’ve manufactured gorgeous drapes and soft goods for numerous major artists, including Maroon 5, Slip Knot, Green Day, Sting, James Taylor, Dave Matthews Band, Madonna, Rod Stewart and Don Henley. 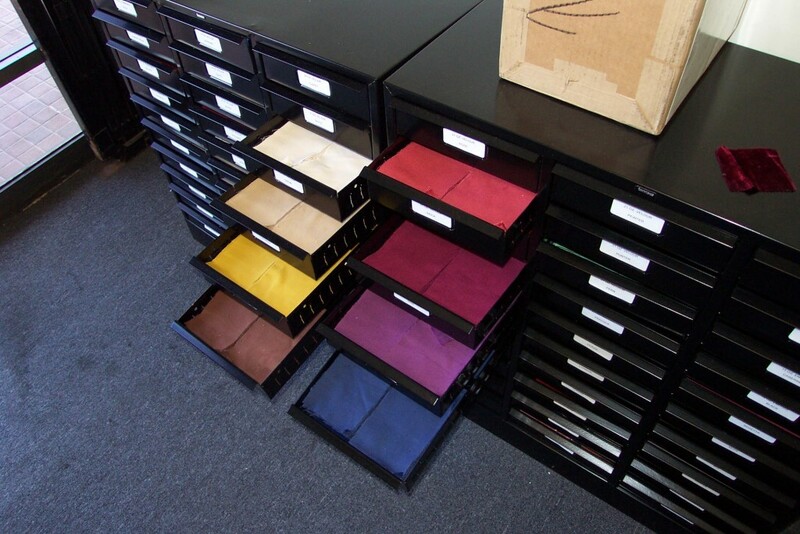 Reach out to us at 310-639-6000 and our experienced softgoods staff will work you up an estimate for your design. 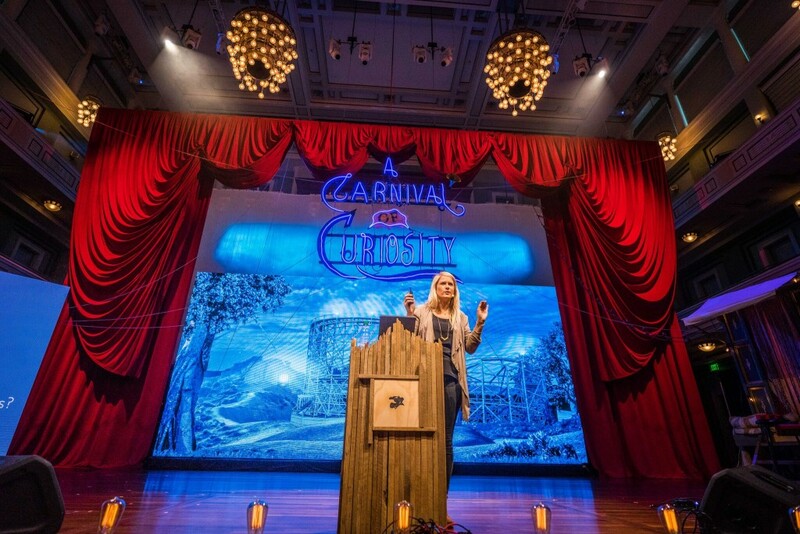 Rockin’ Red Collection Featured in a Carnival Style Stage Design at the STORY 2017 Conference. STORY is a two day conference for makers, creators and artists who tell stories in a variety of mediums, industries and settings. From canvas and screens to classrooms and stages, STORY is for storytellers of all kinds. Part instruction, part inspiration, attendees are challenged and stretched by innovative talks and unique performances. A place to meet new friends and connect with leading creative practitioners, but even more, to be challenged to become a better storyteller. The room awaits the beginning of STORY 2017 while Krazy Kyle welcomes attendees with accordion music. 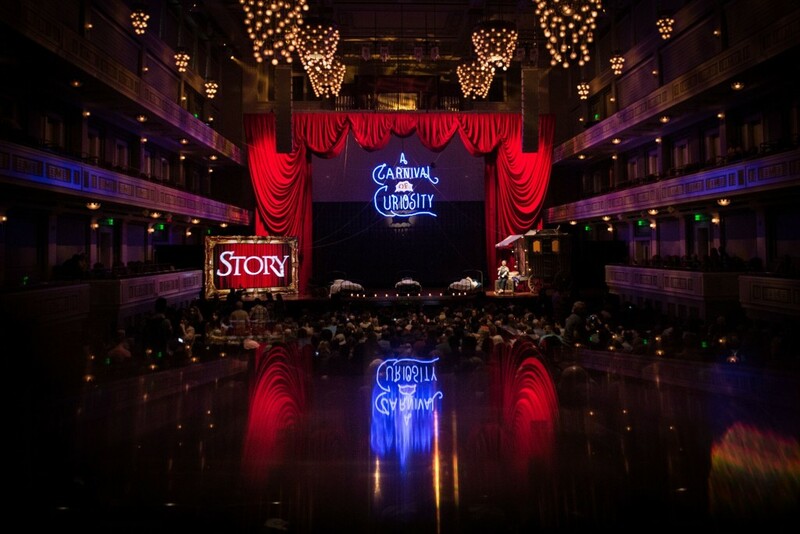 STORY 2017 took place on September 21-22 in Nashville, TN at the Schermerhorn Symphony Center. 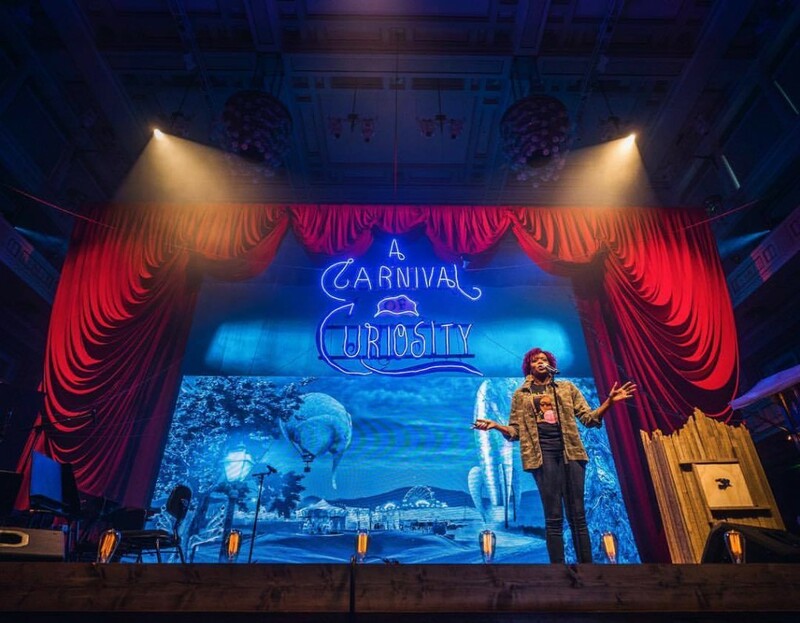 This year’s theme was “A Carnival of Curiosity” where they explored what it would look like to choose our curiosity over our fear. This year’s set design was by Josh Lazar of WAVE, under the direction of Harris III for Istoria Collective. In this image from Facebook, Amena Brown presents at the Story 2017 Conference. Photographer and Humanitarian Esther Havens talks about what it means to tell someone’s story through a photo. STORY selected drapes from our Rockin’ Red Rental Drapery Collection for this installation. With red drapery options that range from Austrian Backdrops and sky-high Legs to Grand Bi-Parting Drapes and Swagged Borders, this Rockin’ Red Drapery Collection lends itself to set designs from the romantic all the way to the dramatic. Add some elegance and super-chic flair to your special events with our luxurious Red Satin Austrian drape and coordinating velvety red drape legs. 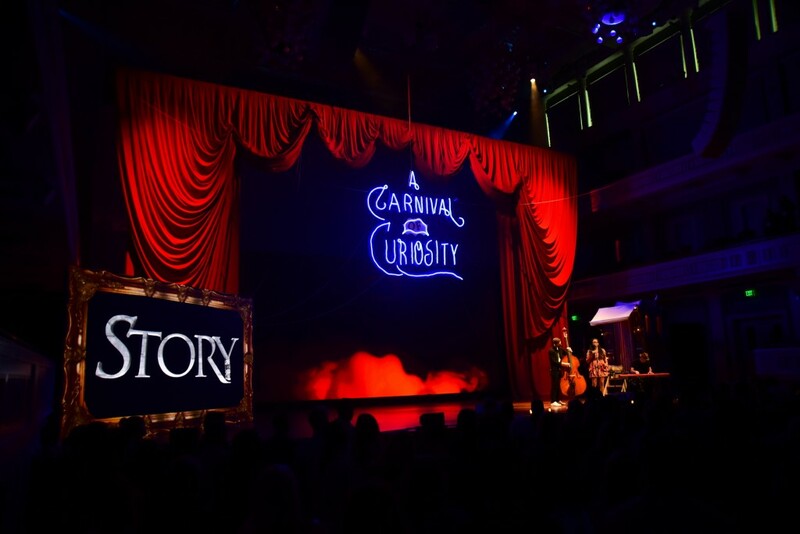 Here is a video showcasing how STORY installed and used our Crimson Venetian and matching Stage Legs to fulfill their spectacular “Carnival” themed stage design. 2017 Day One from Istoria Collective on Vimeo. 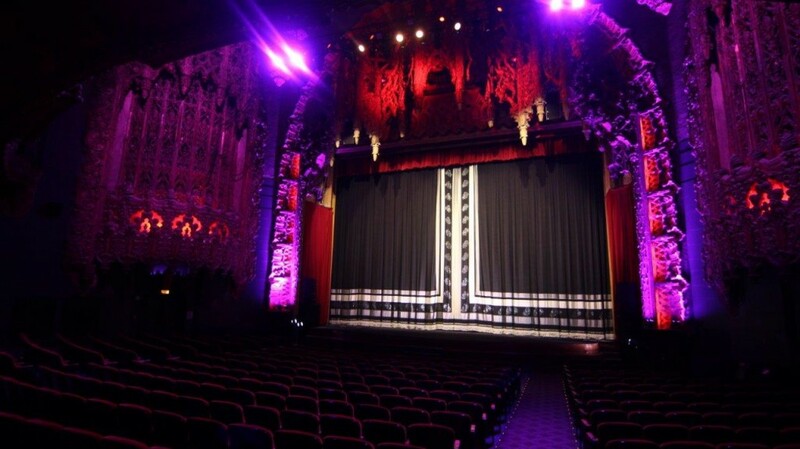 If you are planning on using one of our Drapery Lift Systems, our magnificently decadent Venetian red and burgundy toned rental drapes never fail to get everyone’s heart beating fast with excitement. Having your stage drapes already designed with beautiful patterns and textured details gives stage designers a “creative ease” not always experienced with rental drapes. This collection’s sumptuous red rental drapes are extremely versatile, working perfectly with all types of event designs– everything from lush awards shows to high-octane rock concerts. With harmonious shades of red and burgundy, this rockin’ collection of tempting drapery is sure to captivate your audience! Musician Liz Vice performs during STORY 2017.